There are two volunteer shifts 7 am to 10:30 am, 10:15 am to 1:30 pm. Please make sure you sign in on the volunteer sheet when you arrive. 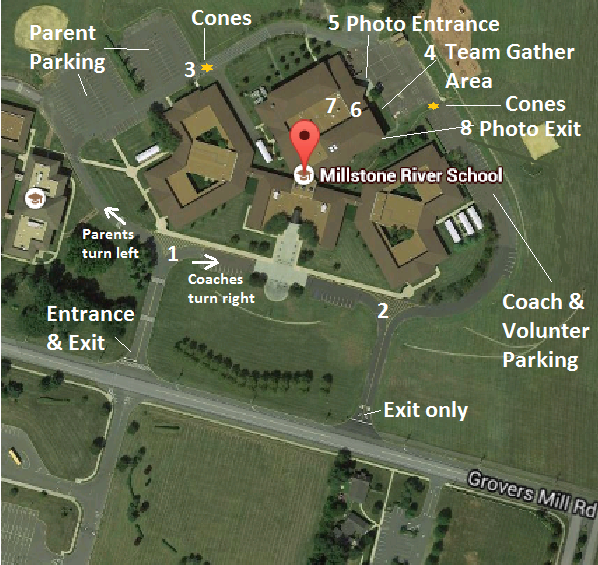 Click here to view a map of the school, the numbers on the map correspond to the volunteer positions. Arrive at 7 am and sign in with one of the leaders. Move tables and chairs out of the way in the two cafeteria rooms. Note: Leaders please take a picture of the way the tables are setup so you can put them back that way at the end of photo day. Take one of the volunteer assignment per below and staff it until you are replaced by a 10:15 am shift person and give them any tips for fulfilling the role. Take one of the volunteer assignment per below and relieve the person who was staffing it. Staff the position until 1 pm and then help with the clean up described below. Place cones back on the side of the road. Move tables and chairs back into their places in the two cafeteria rooms. The janitor will help with this and you can use the photos taken in the morning. One person at split in road to direct parents to back of school left side as coming in, coaches and volunteers to right as coming in. One person at exit road (coaches and volunteer parking area) to ensure people exit out of the correct road. Two people at back parking lot to help people find spots and ensure no-one tries to drive past cones that are used to close off the road to direct people to the photo area. Two people to gather teams outside of building, make sure players remove cleats, check off the team and direct them to go inside once the entire team is ready. Teams should arrive at their arrival time, be gathered and be inside 5 minutes before their photo time. Two people to monitor the door entrance and table with order envelopes. Only players/teams ready for photos or individual players going to the rest room should be allowed inside. Note: Individual players might come to take individual photos at different times to their teams – these players should be directed inside to the photographers’ check in person. One person to monitor the teams inside and line them up in height order. One person as rest room corridor monitor i.e. be in the corridor that leads to the restrooms to ensure players do not wander around the school, they just go to the rest room and then go back outside. One person to monitor door exits. Two floaters (pick up trash, entertain kids, answer questions, help out where needed, etc. ).